Spiced to your taste, this simple carrot soup is a perfect meal anytime. 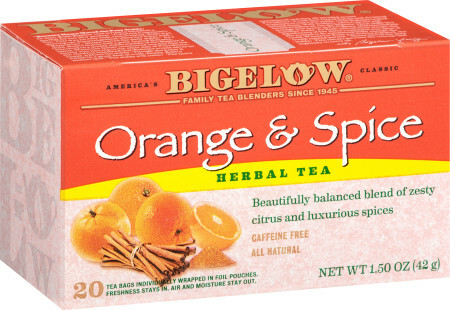 Bigelow has taken it a step further by adding Orange & Spice Herbal Tea. Prepare the carrots. Add 8 Orange & Spice Herbal Tea Bags to 4 cups(1L) of boiling water; let steep for 10 minutes. Remove tea bags. Cover carrots with tea and cook for 10-15 minutes or until tender. Meanwhile, infuse milk by heating with 4 Orange & Spice Herb Tea Bags for 10 minutes. Remove tea bags. Drain carrots and puree in a food processor and add melted butter and infused milk. The carrots should be very smooth. Place in a casserole and garnish if desired with crispy shallots. To make the garnish - slice shallots into very thin rings. In a saucepan heat oil with butter over medium-low heat until it begins to bubble, add shallots and cook until they are a rich golden brown; about 30-40 minutes. Stir shallots occasionally while they are cooking to make sure they brown evenly. Remove shallots from oil, drain. Once the shallots have dried and are crisped, they can be stored for several days. Serve shallots on top of carrots.